You'll have no trouble finding Warner's. I've spent my share of time in St. Albans, but somehow, I never went north of the highway exit on Route 7. If I had, I wouldn't have missed 48-year-old Warner's Snack Bar for so long. 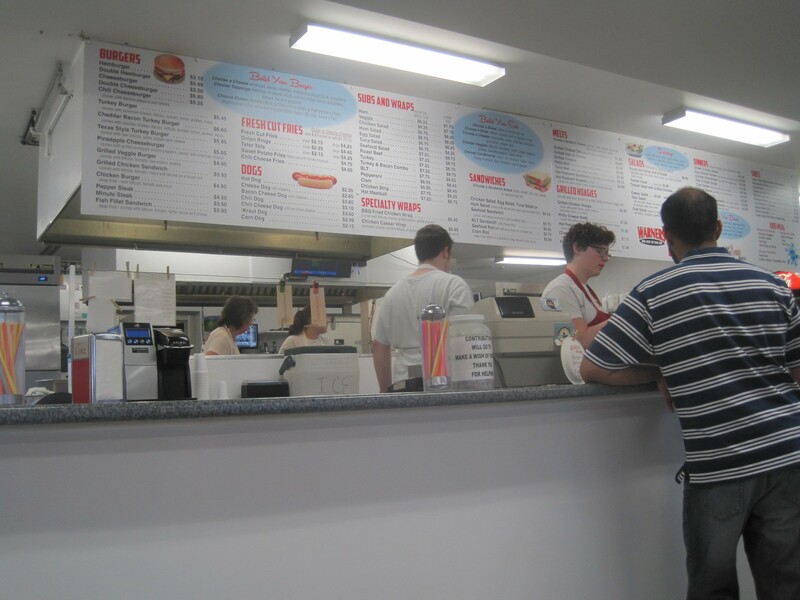 But to celebrate the arrival of warm weather, I decided to pay a visit to the new-to-me snack bar. Warner's isn't your typical shack with a kitchen in it. With an indoor dining room as well as outdoor seating, the snack bar is open from April through December. The eatery's size also enables it to offer a bill of fare significantly larger than most snack bars'. There's a separate gluten-free menu, too, which includes specially coated chicken tenders and burgers and dogs on buns from West Meadow Farm Bakery in Essex Junction. There are coffee drinks courtesy of Green Mountain Coffee and a wide range of hot and iced teas. There's even a salad bar for those not willing to embrace the whole fried-food thing. But I came prepared. Higher-than-average prices for a snack bar meant I wasn't able to try as many dishes as I usually do when reviewing this type of place, so a few second-tier priorities such as a Reuben sandwich and Caesar salad would have to wait. But the homemade meatloaf could not. Notably, it was one of only two items on the menu called "homemade." The implication about the other dishes was not lost on me. At $10.95, the meatloaf wasn't cheap, but was a hearty portion that at first glance resembled a giant slice of red velvet cake. I didn't taste much beef in it, but the bready loaf was flavored with a smattering of sage and a hint of heat. 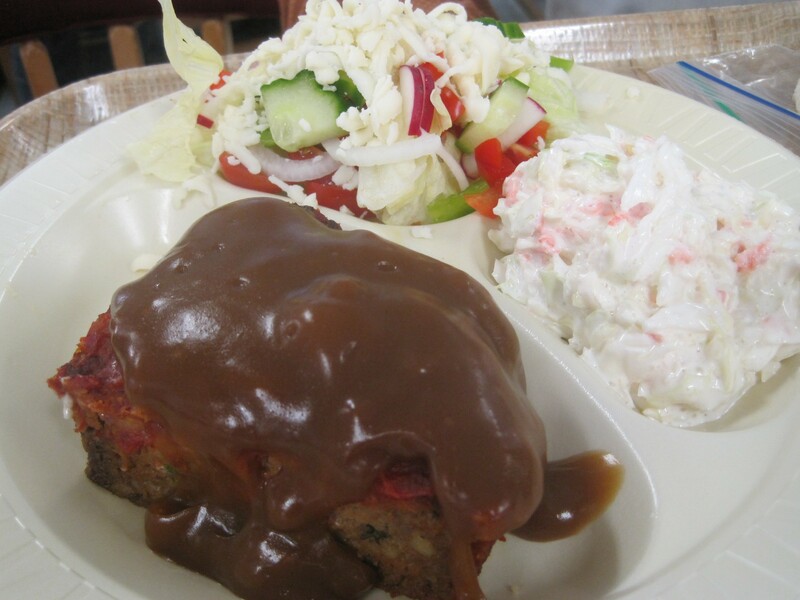 A thick layer of beef gravy was too gloppy for my taste but did make the dish seem more like it had come from grandma's kitchen. The dish came with a choice of two sides (out of 11 options). A thick layer of cheese covered the small tossed salad, as if it had been hit by a highly caloric blizzard. I removed the cheese to reveal surprisingly fresh lettuce, cucumbers, peppers, radishes and onions. A bit of bottled honey-mustard dressing put it in competition with the heavy meatloaf. I hate to admit it, but I wouldn't even taste the other side of mayonnaise, I mean coleslaw. 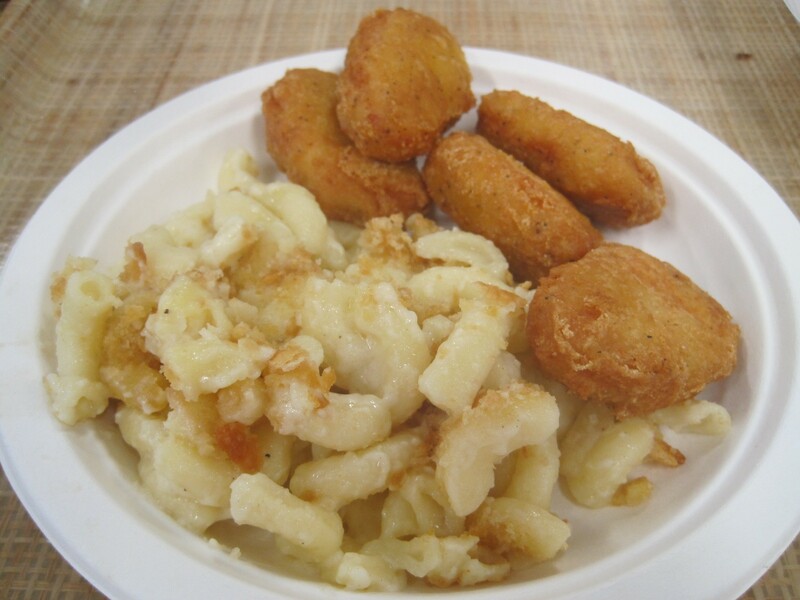 I ordered a kids' meal mostly just to taste the side of homemade mac-and-cheese. And I'm glad I did, because the cook from my elementary and middle school made it. Not really, but the dish was a Proustian experience, for sure. I gobbled down the crumb-covered noodles despite the fact that there was little to no cheese flavor. Pockets of chewy texture in the sauce could have been bland cheese or unmixed roux. But despite these failings, it made me exquisitely happy. The chicken nuggets were flavorful for out-of-the-freezer versions, but if one junk-food treat was a highlight of the kids' meal, it was the inclusion of a Capri Sun. I hadn't experienced that since I was 4 or 5. So bad, but so good. In a recent "Ask the Critic" blog post on Serious Eats, Carey Jones explained how she chooses dishes to review. One method we share is what she referred to as "If it sounds crazy." When I saw the "customers' favorite" Grilled Chicken Deluxe sandwich on the menu, I knew I had to find out how a chicken breast with grilled pineapple, bacon, onions and peppers, along with cranberries and Swiss cheese, would all work together. If you guessed "not very well," you're right. The vegetal sweetness of the peppers and onions mixed with the fruity pineapple and dried cranberries were a pretty significant flavor clash. 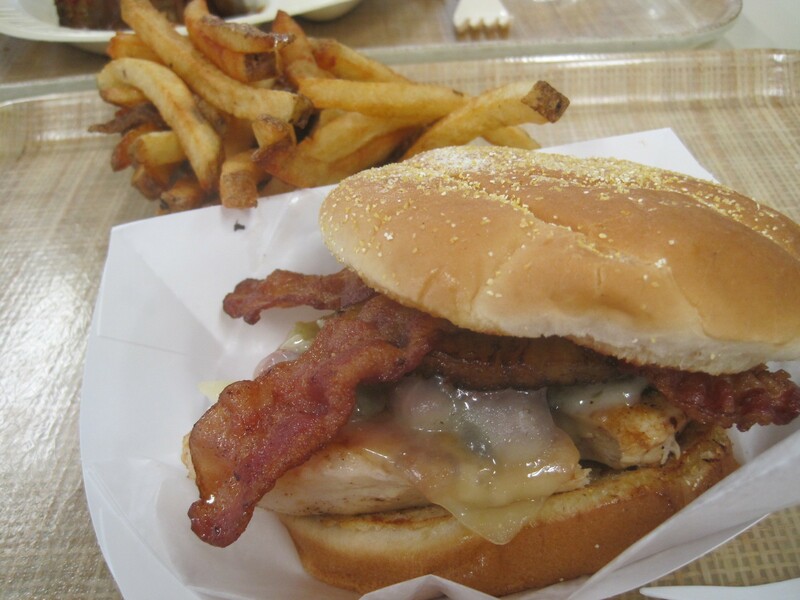 So I scraped away the peppers and onions and enjoyed the fluffy bun, nicely grilled chicken and crispy bacon along with the cheese and fruits. With a few subtractions, I could understand why it was a favorite. But practically anything would be good with those fries. I've often complained of the unblanched ’taters at many Vermont snack bars and even higher-end restaurants. 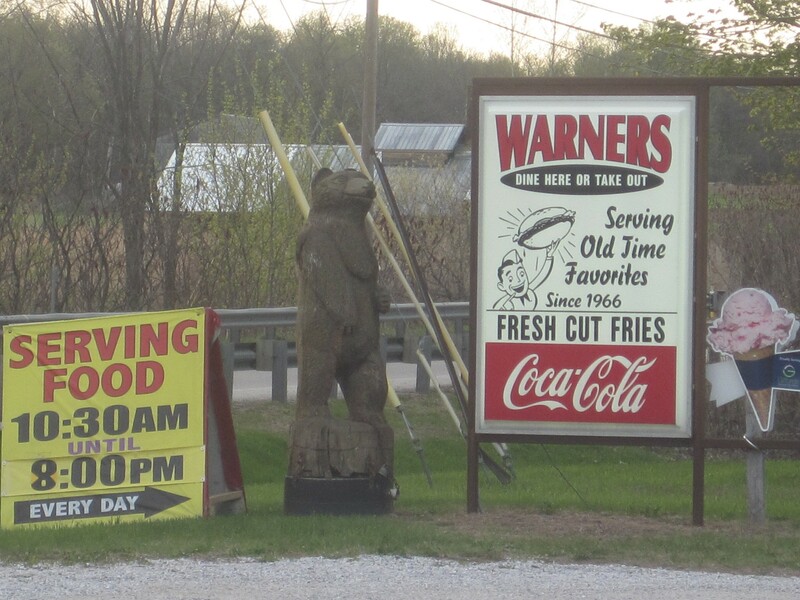 But the skin-on, hand-cut fries at Warner's were tender inside and ideally crisp and salty outside. Some of the best snack-bar fries I've ever tasted. Differing from most Vermont snack bars, Warner's does not focus on creemees. Instead, the eager teenagers on staff serve up scoops of Gifford's Ice Cream and milkshakes, available in three thicknesses. 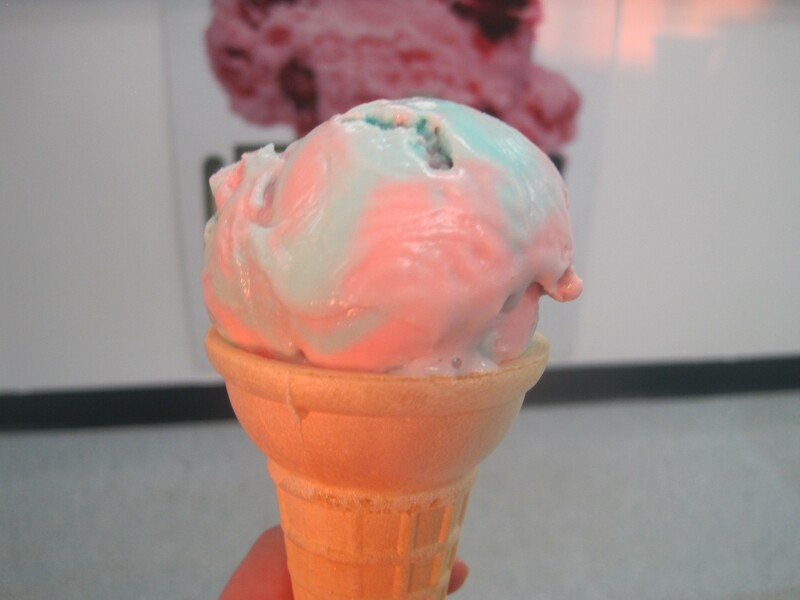 I was already stuffed with greasy food but couldn't bear to skip the giddy fakeness of a scoop of cotton candy ice cream. I enjoyed the sticky-sweet product in its pointy cake cone like a kid who'd never heard of nutrition. The disarmingly chocolaty medium-thick shake on which my dining partner splurged did the same for him. As one nearby table of diners left, the adult female of the family told me, "This is the best restaurant in St. Albans." I wouldn't go that far, but for all my nitpicking, I can't think of a better way to kick off the snack-bar season.